Following an ongoing issue with condensation affecting a first floor flat Kenwood were called to assist. Kenwood have a dedicated team of surveyors specifically to deal with problems of condensation. Many factors affect which type of system we install such as the layout of the property, the severity of the problem and the type of occupancy. 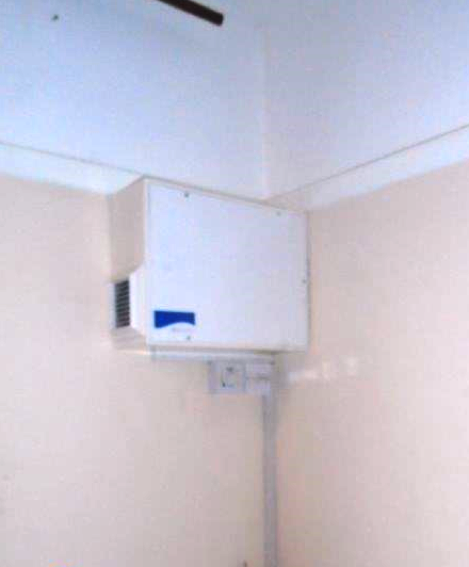 This particular project involved the installation on a Positive Pressure Ventilation System. No loft is present and therefore the primary unit has been installed within the living room. This coupled with the strategic placing of Passive Ventilators within the bedrooms works as a full home solution. The control unit brings in fresh filtered air which pushes the damp moisture laden air out via the passive ventilators. This creates a flow of ventilation through the home preventing condensation from becoming a problem.